The old adage ‘Location, location, location’ says it all. 3rd Street Flats offers two prime locations for exploring Historic McMinnville and the rest of the Yamhill Valley. 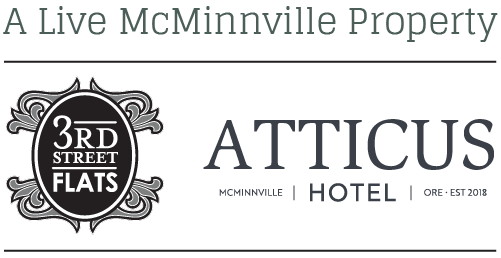 Ideally situated three blocks apart on Third Street, McMinnville’s historic core, the Historic McMinnville Bank & the Odd Fellows Lodge are nestled in amongst fabulous restaurants, tasting rooms, bars and boutiques. Downtown McMinnville can be easily accessed off of either Highway 99W or Highway 18. Guests pick up their keys at The Bitter Monk any time from 3:00 pm until close (10:00 pm Sunday-Thursday; 11:00 pm Friday-Saturday). The Bitter Monk (250 NE Third St) is located on the corner of Third & Cowls at the retail level of the Historic McMinnville Bank building. Guests arriving after The Bitter Monk closes pick up their keys at the lock box at the entrance to 3rd Street Flats. The code to the box is included in our confirmation email. There are two public parking lots behind the Historic McMinnville Bank, one on the east side of Cowls and one on the west side. Additional unrestricted parking is available on the east side of 2nd and Cowls in the Presbyterian Church lot. Parking on 3rd Street is limited to two hours during the day, but is unrestricted from 6:00 pm to 9:00 am. Guests pick up their keys at R. Stuart & Co. Wine Bar any time from 3:00 pm until close (6:00 pm Sunday-Tuesday; 8:00 pm Wednesday-Saturday). R. Stuart (528 NE Third St) is located directly across the street from the main entrance to the Odd Fellows Lodge. Guests arriving after R. Stuart closes pick up their keys at the lock box at the entrance to 3rd Street Flats. The code to the box is included in our confirmation email. Street parking is free between 9am – 6pm (2 hour), but unrestricted after 6:00 pm weekday evenings. Street parking is unrestricted on weekends. There is additional unrestricted public parking 2 blocks away in the parking garage on the corner of 5th and Evans (5-minute walk). 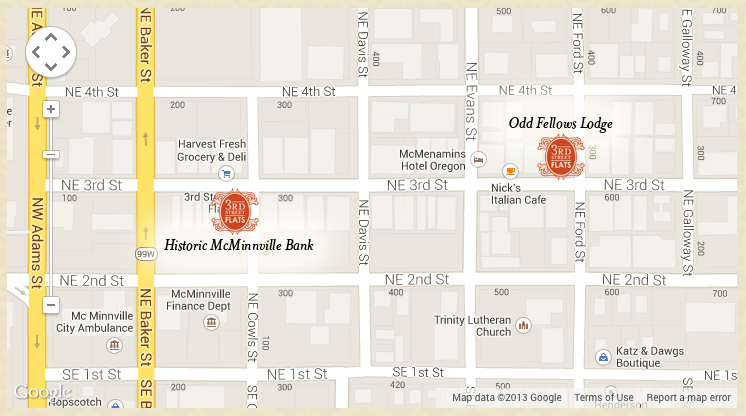 So immerse yourself in if Historic Downtown McMinnville. We know you won’t want to leave!